Following Britbus' success with the AEC Swift models, the earlier and longer AEC Merlin was added to the range in 2006. The model is available in both single & dual door form and the seating can be produced in various layouts to allow production of the standee version used on Red Arrow services and vehicles with & without automatic fare collection equipment. 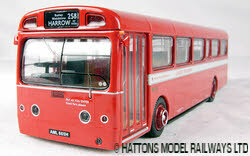 The AEC Merlin wasn't a huge success with London Transport and most of the buses were withdrawn after only a very short career in the capital. The longest surviving vehicles lasted into the early eighties where they operated the Central London Red Arrow network of routes. Some of the vehicles passed to London Country Bus Services on it's formation in 1970 and many remained in service with the operator until Leyland Nationals replaced them in the late seventies. Like the earlier Britbus Swift these models have poseable front wheels but don't feature and opening engine panels.